Lightweight, balanced and super versatile. Continuing on the tradition of the Godin Summit CT, the all new Summit Classic Supreme Ltd Cherry Burst Flame is a serious rock machine. 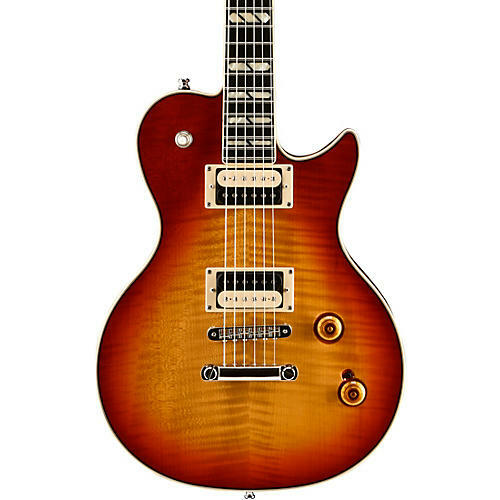 The hand-wound Lollar El Rayo pickups produce rocking tones whether played clean or overdriven and its High-Gloss Cherry Burst finish highlights the guitar’s stunning Flame Top. Beneath its ergonomically carved Maple Top is a Mahogany body with 5 hollow chambers strategically placed throughout the guitar’s body. Each is tap-tuned to a different note ensuring rich, musical tones and extremely consistent note-to-note balance. This incredibly lightweight and resonant chambered Custom Shop beauty is a joy to play and comes with special Godin hardshell case. Enjoy North American quality and versatility. Order today.